eCom Leverage | Sell more. Profit more. This episode is about using social contests (such as giveaway sweepstakes) to generate ever-growing online reach and traction for your brand. This relates to an interview of my friend Phillip I did on the podcast a few months back in Episode 17: How Phillip Built a Launch Email List of 2700 with No Paid Traffic. People love contests and giveaways! You can grow your audience and grow your brand’s reach significantly by stacking giveaway contests, one on top of anther, week after week. One way to do this is to offer a giveaway drawing (sweepstakes) where you give away a gift that your very best prospective customers are likely to want to win. Give them entries in your contest for taking actions like joining your email list, viewing your social media, inviting friends to enter the drawing, and posting about you on social media. When you do this week after week, your results grow as you have an ever-widening circle of people entering your contests and telling their friends about them. For ease, for effective social sharing features, and for legal compliance, I recommend you use third-party software to run your contests. We use Gleam, but there are many others out there as well. This was the second in a series of giveaways like this that we’ll be doing for this particular brand, running right up until Cyber Week. We’re excited to have a large audience to promote Cyber Week sales to by the time it rolls around! Want our detailed checklist that we use for setting up social contests through Gleam? Or want us to help make sure you’re ready to roll and not overlooking any big opportunities as the holidays approach? Need help improving sales online, dealing with issues related to Amazon, making sure you’re not wasting advertising money unnecessarily, or with anything else? Book a consultation today! If you sell on Amazon using Fulfillment by Amazon (FBA), there are a few things you should be doing to avoid uneccesary expenses. You also want to avoid receiving penalties or inventory storage restrictions from Amazon as they gradually tighten their policies. Regularly check the shipments you’ve sent to Amazon to make sure there were no issues reported by Amazon. To do this, go to Inventory > Manage FBA Shipments in side of Seller Central. To learn more about your IPI directly from Amazon, click here. If your IPI drops below 350, Amazon will restrict the amount of inventory you can store in their fulfillment centers, and you may suddenly have to pay hefty inventory overage fees ($10 per cubic foot) for any inventory stored there above the amount to which they’ve restricted you. To learn more about this new policy from Amazon, click here. To view your inventory performance, go to Inventory > Inventory Planning inside of Seller Central, and then click on the ‘Performance’ tab. Need Help Managing FBA or Getting the Most Out of the Holidays? Contact us to schedule a strategy session! According to a recent announcement, Amazon may suspend your ability to ship to FBA if you cancel shipments that are part of a multi-shipment shipping plan, or if you misroute shipments or send incomplete shipments. Shipping case-packed product is one way to avoid having to split up so much product to different locations. Anecdotally I have noticed that the larger the shipment, the more Amazon seems to have you send it to a single location, and one that is closer to you. Amazon now assesses long-term storage fees on the 15th of every month, rather than just twice a year. This means that you want to make sure your inventory keeps turning over and doesn’t sit for months, or you’ll pay some hefty long-term storage fees. You can read Amazon’s policy here. Amazon doesn’t want their new long-term storage fee policy to be a deterrent to brands launching new products, so they recently announced a special promotion. If you list a new product between now and November 30th, and your inventory arrives in Amazon’s fulfillment centers no later than November 5th, then Amazon will reimburse long-term storage fees on the qualifying products until they have been in the fulfillment center for more than 365 days. Make sure you’re ready for 4th quarter selling! Book a consultation with us today. Reminder #1: The deadline is September 21st to submit lightning deals for Black Friday and Cyber Monday. Reminder #2: As announced on Episode 47, get Seller Labs’ Ignite product at a 10% discount using sellerlabs.com/leverage (that’s an affiliate link). All Amazon’s advertising products are being combined under one new advertising home called Amazon Advertising. You can find it at advertising.amazon.com. Sponsored Products is the way to put specific products in front of customers who are already searching for them. Sponsored Brands (formerly Headline Search Ads) is the way to put your brand, including multiple products, in front of customers who are more generally interested in the category your brand relates to or in certain products related to your brand. 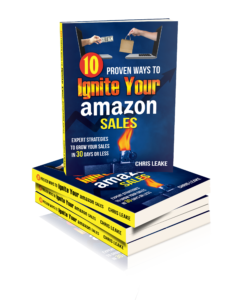 Gain the ability to track the results you get from traffic you send from outside Amazon. Now you’ll be able to see how traffic you send from places like Facebook or your own website convert on Amazon. This program is currently in closed beta. To learn more, visit amazon.com/amazonattribution. This is another beta program from Amazon. It gives Sponsored Products advertisers who are running auto campaigns the ability to have their products shown on websites outside of Amazon to customers who viewed them but didn’t purchase, or to customers who viewed similar competitor products. Need help successfully selling your products and managing and protecting your brand on Amazon? Contact us! Seller Labs is the creator of several excellent tools for Amazon sellers, such as Feedback Genius for sending automated emails to Amazon customers, Scope for doing keyword research, and Ignite for managing Sponsored Products campaigns. In this week’s podcast episode I interview Tyler Henderson of Seller Labs and get some great insights from him about how to get the most out of Amazon Sponsored Products Ads campaigns. Tyler also shares 4 common pitfalls to avoid in Amazon advertising. If you have the budget and you’re in discovery mode, weight your campaigns more heavily towards Auto campaigns in the beginning to get good data from Amazon. Over time, shift what’s working from auto campaigns over to manual targeting. Use negative filtering to remove what’s not working from auto campaigns. When an auto campaign causes your ad to get displayed on a competitor’s product detail page, look at the competitor’s product page for more keywords you can target. With continual optimization over time, you can see more and more of your auto campaign spend go to displaying your products on competitor’s detail pages. Using irrelevant keywords – Shoot for quality, not quantity, because having your ads displayed for irrelevant keywords wastes money and does you no good. Auto targeting cruise control – Don’t run auto campaigns that you never check or optimize, because you will waste a lot of money. Bidding too low – The lower you bid, the longer it will take you to get results and data. If you want good data fast, then make sure to bid high enough so competitors aren’t constantly outbidding you. Checking too often – Yes you have to keep a good watch on advertising campaigns, but if you check too often you’ll jump to conclusions without having enough supporting data. Visit https://sellerlabs.com/leverage and use the promo code “leverage” to get 10% off your first 12 months of the Ignite tool for managing Amazon ad campaigns! Need Help with Your Amazon Advertising? Contact us to set up a free half hour consultation and see if we might be a good fit for working with one another! 046 – Which Amazon Seller Central FBA Settings Should You Use? If your company sells on Amazon using your own Seller Central account (and we recommend that you do), you have some important choices to make about which FBA settings to use in Seller Central. In this podcast episode we walk you through all the FBA settings in Seller Central and what they mean, and we provide our recommendations on which settings you should use. Looking for Help Selling on Amazon? If you’re ready to get some assistance with your company’s Seller Central account, your Amazon strategy, or anything else related to e-commerce or selling on Amazon, complete this short form to schedule a consultation with us! The internet has changed the way things are launched…whether books, radio shows, physical products, or a host of other things. You don’t need to take big, expensive risks of new products anymore. Platforms like Amazon and Facebook give you very inexpensive ways to test the market and know whether a product is going to sell before you ever produce it! Want some help or insight with planning and launching your next product? Contact us! Understanding the difference between push marketing and pull marketing is essential for any business that is selling online! Far too often, businesses spend money on the wrong thing at the wrong time because they don’t understand push marketing vs. pull marketing. Other businesses have hit a plateau online and don’t know why…again, because they don’t understand how this fundamental contrast applies to their business. Push Marketing is any marketing activity where you are pushing your message/offer to someone who wasn’t expecting it or wasn’t looking for it at the time. Traditionally, push marketing has been things like radio ads, TV ads, and billboards. In the online world, push marketing is things like Facebook ads, YouTube ads, website banner ads, etc. These types of ads represent the “TV, radio, and billboard ads” of the internet. Push marketing has become much more powerful in recent times online, because of the powerful targeting available through platform like Facebook and websites such as niche blogs and forums. On Amazon, Headline Search Ads can take on an element of push marketing. Your business has a great offer that converts well, and you’re already doing well with pull marketing. Now you need to reach new customers who weren’t already looking for you. You have a brand new product or service that people don’t know about and therefore aren’t looking for. Pull Marketing is any marketing activity where someone is actively looking for what you offer, and you are in the right place at the right time to get found by them. Traditionally, until the internet took hold, the yellow pages were one of the most effective forms of pull marketing. Currently, one of the most effective forms of pull marketing on the internet is search engine marketing…both organic search engine optimization as well as pay-per-click (PPC) ads. Amazon is predominantly a pull marketing platform, though it has elements of both. You have a brand new product or service, and no one has heard of you, but customers are already looking in specific places for the type of solution your business offers. You have an established product or service that customers are looking for. You are not yet the clear and obvious choice to customers in all the main places they would look for your product or service. 043 – Intro to E-commerce Analytics: What Should You Pay Attention To? Most companies have some kind of tracking in place to provide information about people visiting their website. But a lot of businesses don’t ever check this data, and even fewer businesses, even if they do check the data, know what to look for and how to read their analytics. In this podcast episode my brother Daniel and I discuss the basic analytics points that you should be checking regularly and how to do it without taking tons of time and energy. What Tracking Technology Should You Have Installed on Your Website? Remember: If you’re spending a lot of money on advertising, paying attention to even basic analytics can make a difference of thousands of dollars in your ad budget and in your sales. So read your analytics! Hire Us for an Analytic Review! If you have steady traffic or are spending money on online advertising, hire us for an analytic review…could make a significant difference to your bottom line! Included is an analysis of your analytics as well as a one-hour phone consultation to go over the results. To request an analytic review, click here. This week we’re rebroadcasting one of our most popular episodes — Episode 8: 700k Product Video Views Using a Platform No One Talks About. In Episode 8 we talked about a strategy we were using to get a ton of views of a product video for one of our clients, and how those views were leading to a rapidly growing list of subscribers acquired at a very low cost. You can find the show notes for Episode 8 here.